Easy to use interactive graphs and charts. 31 January 2018: The Environmental Protection Agency (EPA) has launched the NationalWaste Statistics web resource and has also published information on hazardous waste for 2015 and 2016 and municipal waste for 2014. The new web resource replaces the EPA’s biennial National Waste Report as the primary source of waste statistics in Ireland. The EPA will regularly update National Waste Statistics, providing the latest information, graphics and commentary on priority wastes, waste infrastructure and trends. In launching the National Waste Statistics web resource today, the EPA also published information on hazardous waste for 2015 and 2016 and municipal waste for 2014. The amount of hazardous waste managed in Ireland rose by 18 per cent in 2016 to 409 ktonnes. The increase was due mainly to an increase in the amount of contaminated soil from construction sites. On the positive side, there was a decrease in the amount of waste treated onsite of generation in the pharmaceutical industry, reflecting cleaner production methods in this sector. 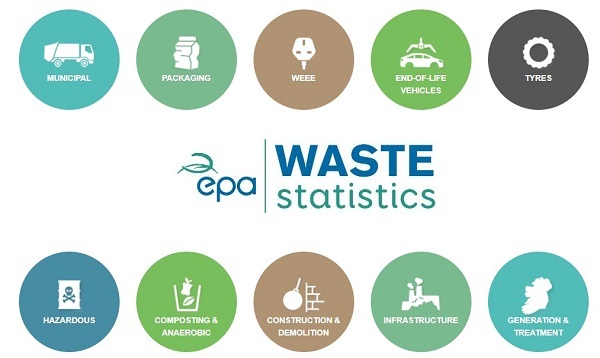 Through the new NationalWaste Statistics web resource, the EPA will provide the information needed to make informed choices and policy decisions in relation to waste generation and management. It will be of benefit to researchers, students, teachers, people working in the waste industry, government, media and the public with an interest in waste generation and management in Ireland. Municipal waste means household waste as well as commercial and other waste that, because of its nature or composition, is similar to household waste. It excludes municipal sludges and effluents. It consists of three main elements – household waste, commercial waste and industrial non-process waste that falls within the definition of municipal waste and litter and street cleansing waste. Circular economy: In a circular economy, the value of products and materials is maintained for as long as possible; waste and resource use are minimised, and resources are kept within the economy when a product has reached the end of its life, to be used again and again to create further value. To facilitate the move to a more circular economy, the European Commission put forward a Circular Economy Package in December 2015, which includes revised legislative proposals on waste, as well as a comprehensive Action Plan. In January 2018, a “European Strategy for Plastics in a Circular Economy” was launched outlining the vision for a circular plastics economy.